Okay, I’ve officially had enough of multi-team tag title matches at Pay-Per-Views. It’s quite transparent that this is just an attempt to get everyone on the show, and build those matches where 10 guys do dives in a row, so there’s always someone on the ground to catch the next guy. Here’s a question. What the hell have Los Matadores done to earn title shot after title shot? Same question for the Lucha Dragons. Both teams are talented, but have zero momentum, and zero storyline entitlement to anything at all. I hope this match is the end to this tired trope of “if you’re a tag team, you get a tag team title shot.” If not, I may give up on the tag team scene for a while. I’ll be angry if: The Dragons win. I’ll be angrier if: Los Matadores win. 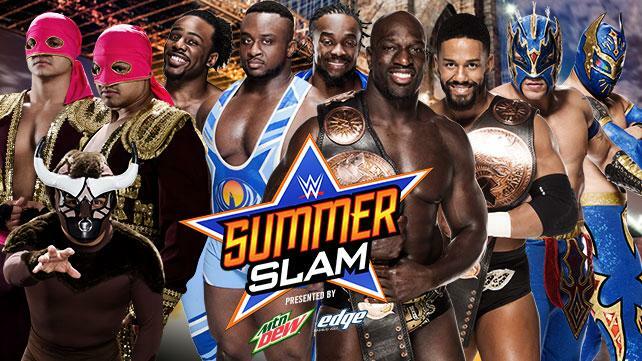 I’m expecting: The New Day regains their titles, and are chased by all the face teams. If I booked it: The Usos return, saying that since they’ve left, they’ve seen undeserving team after undeserving team challenge for the tag titles that they should have never lost. As heels or faces, The Usos would breathe new life into what has quickly become a very stale division in their absence.